"We couldn't be happier with our commerce provider. Having gone through the pains of an in-house built solution, and then an unsuitable 3rd party tool, we appreciate Avangate even more. Because things got that much easier with Avangate, we have much more time to focus on new customers, improve our SaaS product and roll out large projects while most of the daily business runs smoothly. They enable us to provide a seamless online selling experience from the first acquisition to renewals, whether direct or via partners, for the home-user to the Fortune 500 customer. A commerce solution done right," said Christian Sprajc, CEO of PowerFolder. From the beginning, PowerFolder have been very aware that they need to automate ordering and billing as much as possible, so they can focus on developing their products. The goal was to implement a commerce solution to allow them to sell online, both in their local market as well as internationally, direct as well as via partners. 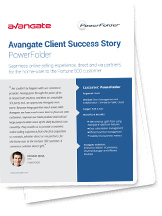 Following significant business growth, with clear requirements for the commerce solution they needed, PowerFolder selected Avangate as their digital commerce provider. "Our Partners and resellers have an easier life: now many of the processes are automated, our partners can place most orders in self-service mode or we can place and process orders for our partners within minutes, during the first call," Christian Sprajc, CEO at PowerFolder.